Democratic presidential candidates are constantly being compared with the current commander in chief. Now, two Hawaii genealogy buffs say they have proof President Bush and the current Democratic front-runner share similarities thicker than water. 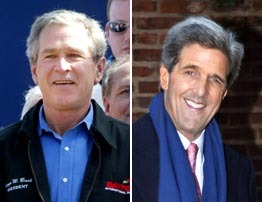 President Bush, left, and Sen. John Kerry, D-Mass., are also purportedly related to Walt Disney and Marilyn Monroe. Bruce and Kristine Harrison, publishers of historical databases, traced back the family histories of Bush and Democratic Sen. John Kerry. The link between the president and the Rev. Al Sharpton might date back a bit further, Bruce Harrison said, but tracing ancestries helps illuminate a greater message on human interconnectedness, if not one on the centrification of the nation's politics. "I believe everybody on the planet is related if you go back far enough," said Harrison, 51, whose Millisecond Publishing in Waimea on the Big Island puts out a line of ancestral history CDs. He and his wife have spent the last eight years compiling information from hundreds of genealogical books and periodicals. "We're setting the stage for others to explore their curiosity," he said. The Honolulu County Genealogical Society's Mary Ann Bolton said she was not too impressed with those who troll family trees looking for star-studded connections.